This soup has a rich, garlicky chili leaning broth, spiked with lime, tender chunks of pork, and surprise – carrots and potatoes. Ok, so I added the potatoes! And they’re delish in this. If you’d rather, omit the potatoes and serve this stew over rice for a more traditional take, but trust me, the potatoes are the way to go. They pick up so much flavor from that gorgeous broth. I’m showing you two ways to make this soup-like stew. One’s a slowly braised version done on the stovetop or in the Instant Pot. The other is a shortcut version done on the stovetop or in the Instant Pot. Well, technically, that’s four versions, so don’t be scared about how long the recipe is – it has instructions for all. Yucatan Pork Stew Instant Pot or Not is super simple, and it’s a bit surprising how flavorful it is – but not hot. It only has Ancho chiles, which are dried poblanos, and very mild. What they bring to the table is a rich color and taste, You might pick up deep fruity raisiny and mild coffee flavors. With the chili flavors and a pinch of clove, lots of garlic and a good hit of lime, you’re going to be in for a taste sensation. A fun garnish of fried tortilla chips takes this over the top, but tortillas aren’t out of place either. They’re so good dipped in. To fry the strips, just cut tortillas into thin strips and heat up about a half an inch of oil in a pan. Heat to 350 degrees (a tortilla strip will bubble when dipped in) add the strips and stir around so they “tangle up” a little. Remove when golden and drain. I mentioned this soup is super simple, all versions, but the shortcut version is the simplest of all. That’s because I start it out with the trimmings from a rack of ribs and cook those trimmings right along with the ribs. Depending on how you make the ribs, smoked, in the oven or in the Instant Pot, you might have a glorious, flavorful broth to use in this soup, too. All instructions are in the recipe. It doesn’t really matter what ribs you make, for this soup, you’re after the trimmings that come when you prepare your ribs for cooking. So often those trimmings are wasted but no more! The particular ribs I used today were my Competition Ribs and I love using the rib trimmings because the rubs bring a little sumpin’ sumpin’ to the soup party. Flip over to that post to see what I mean by the “trimmings.” This soup can also be shortcut with pulled pork, but the pork will have a more shredded texture. And of course, making Yucatan Pork Stew Instant Pot or Not totally from scratch, using either pork shoulder or the rib trimmings is excellent, too, it just takes longer, On the stovetop, it takes about 3 1/2 hours for the slow-simmered goodness and in the IP about an hour and 15 minutes, so you can see why I like to use the shortcut. This whole soup-like stew, even from scratch, is dirt cheap to make. It’s even less expensive when you utilize the offcuts from the rib, cuts that might not reach their full potential otherwise. Other recipes I use these same cuts in are my Denver Green Chile, a gorgeous chili that’s particular to the Front Range in Colorado or my New Mexican Pozole. I think it’s a toss-up as to which one of the three I like more, but Yucatan Pork Stew Instant Pot or Not seems lighter. Links are at the bottom of the page. 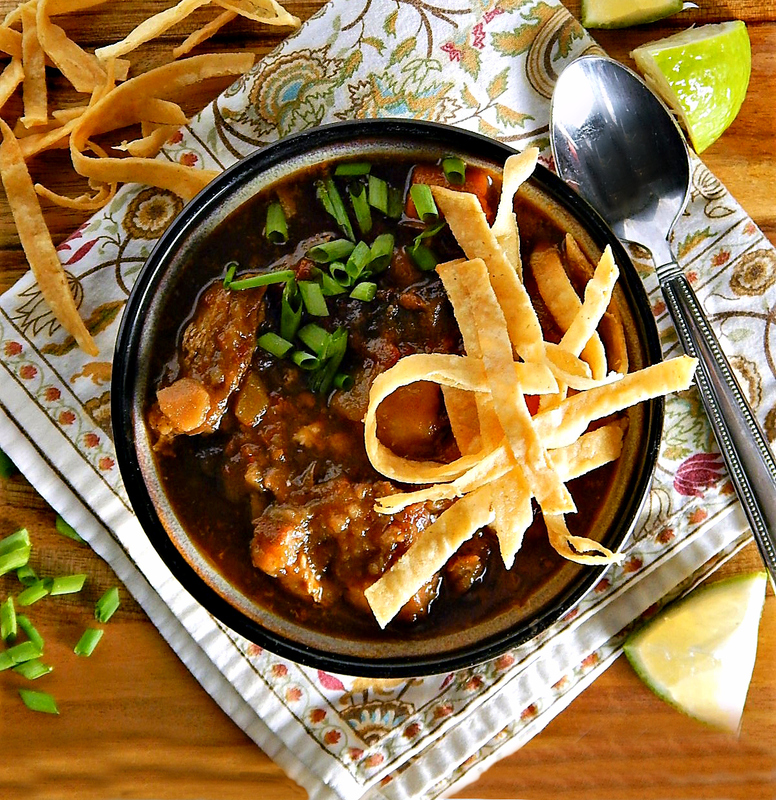 Because so many of the items in this stew are basic and I’ve talked about them so many times (hello potatoes, carrots, broth) let’s talk about the Chiles. I’ve never seen them on sale at my grocery, but you’ll find them much cheaper at a Mexican or Latin American market. If you don’t have easy access to one, check a grocery near areas that have a Latino population. Even in the same chain of stores, you’ll likely find better prices. If they’re in a flimsy bag, and they probably are, repackage them in something sturdier and they’ll keep for a good long time. Prepare the ancho chiles. Add chiles to a hot skillet and toast until they begin to puff, turning as necessary to prevent burning. Remove from heat and let cool until they can be handled. Remove the stems and seeds and cut into 1/4 inch strips. Set aside. Heat oil in a Dutch oven or in the Instant Pot and brown pork on all sides, working in batches if necessary. Add the onions, garlic, chicken stock, tomatoes and their juice. cloves, salt, pepper, and the reserved chile strips. Continue with the Traditional Stovetop Method or Traditional Instant Pot Method. If making on the stove, bring to a simmer. Cover partially with a lid and simmer until pork is tender about 3 hours. Add carrots, potatoes and lime juice and continue to simmer until vegetables are tender, about 20 to 30 minutes longer. Serve with additional lime and cilantro as garnish, sprinkle with tortilla strips or serve with tortillas if desired. Seal the Instant Pot and set to High Pressure, 25 minutes. When finished, allow to go to the Keep Warm function and after 20 minutes, release any remaining pressure. Add the carrots, potatoes and lime juice, reseal and set at High Pressure for 8 minutes. Allow to go to Keep Warm function and release any remaining pressure after 10 minutes. Serve with additional lime and cilantro as garnish, sprinkle with tortilla strips or serve with tortillas if desired. Clean up the reserved, cooked pork by removing excess fat, bones, and cartledge. Cut into 1 1/2 to 2-inch chunks. Set aside. Continue with the Shortcut Stovetop or Shortcut Instant Pot Methods. Bring the combined broths, along with tomatoes and juice to a simmer in a Dutch oven. Add the reserved chile strips onion, garlic, salt, pepper, and cloves and bring to a simmer. Add carrots, potatoes and lime juice. Bring to a simmer and simmer until vegetables are tender 20 to 30 minutes. Turn heat off, add the pork and let heat through. Serve with additional lime and cilantro as garnish, sprinkle with tortilla strips or serve with tortillas if desired. Add all ingredients except for the reserved pork, garnishes and tortillas, if using to the Instant Pot. Seal and set to High Pressure, 8 minutes. Quick release when finished and turn off Instant Pot. Add the pork and let heat through. Serve with additional lime and cilantro as garnish, sprinkle with tortilla strips or serve with tortillas if desired. I’m sharing this recipe at Fiesta Friday #227 cohosted this week by Lizet @ Chipa by the dozen and Jhuls @ The Not So Creative Cook. This entry was posted in Click here for Bargain Meals, Click here for Fabulous Food Posts and tagged canned tomatoes, Carrots, Chicken Stock, Hot Peppers, Instant Pot, Lime, Mexican or Southwestern, Pork, Pork Ribs, Pork Shoulder Recipe, Potatoes, ribs, Tomatoes, tortillas. Bookmark the permalink. Loved it! Next time I think I might add chard or spinach at the end. Perhaps a bit of cumin and chili powder. Hi Stacy, I’m so excited you made it and so sweet of you to stop back with some feedback! I love the idea of a sturdy green in this = kale might work, too. I will be adding that next time I make it. And of course you can never go wrong with a little more spice. We’d love this Mollie!! You are such an adventurer with out of the mainstream ingredients! I think I’d make it without the potatoes and put it over rice, like you mentioned. Is it really summer there now?? Have summer plans? hugs from here! Oh yeah, we had three days of spring and then hot as hades! And in MN where it’s usually so comfortable in the summer. Well I just can’t be pleased this year, I guess! Mmm those crispy tortilla strips look incredible! lol. and yes, they are! Luckily I made extras! I love Mexican flavours, this sounds so tasty! Hi Cat! This was fun and I love discovering a new to me dish…oh the flavors!! The flavours sound amazing. Lovely dish. Hi Virginia, this is almost addicting, I’m afraid! Oh, yeah, it could take a good bit of spiciness and still be excellent. Maybe even better! Sorry for the late repy, internet issues!